The Balboa M7 control is a patented technology used in all of Balboa’s current spa control systems. and flow conditions that exist within the heater. hydraulic variables and at worst case conditions. will provide a uniform flow in either direction through the heater. This uniform flow must occur during heating and filtering cycles and must not fall below 20 GPM under any circumstances. the plumbing schematics before attempting to test the system or install it in a spa. • The heater requires at least 20 Gallons per Minute (GPM) of flow for proper function. 1. NOTE: The amperage limitation for the Circ Pump must be adhered to so as not to overload the printed circuit board ampacity. Locating and mounting the system is very important when designing the equipment area and plumbing. The M7 technology opens up new possibilities since the system and heater can be mounted on either the suction or pressure (discharge) side of the pump. To improve reliability, take steps to minimize vibration from the pump(s) that could be transmitted to the system box. Using rubber isolation pads under the pumps and flexible PVC between the filtration pump and the heater are just two ways to help minimize vibration. Mount the system with the heater horizontal and as low as possible in the equipment compartment. Systems mounted higher than the equipment floor risk air entrapment within the heater tube, this can cause element damage, leading to a shorter useful life. Do not mount the system directly under the control panel mounting location to avoid any potential for water to dip directly on the system. Allow a drip-loop in the control panel wires to keep any water that may travel down the wire from wicking into the system box. When mounting the system on the pressure side of the pump, care must be taken to mount the system in such a way that it is supported without hanging on the plumbing. Each box has available ears that mount to the back of the box with screws to facilitate this type of installation. When mounting the system on the suction (vacuum) side of the pump, care must be taken to mount the system in such a way that it is aligned with the suction port on the pump wet-end. The suction-side mounting can generally be done much lower in the system, making it easier to keep proper water flow in the heater at all times. The system should be mounted with appropriate fasteners, using the feet molded on the bottom of the box. Note: When employing suction-side mounting, the system may need to be placed on a spacer block so that it complies with UL height requirements for electrically live components, in the same manner as a pump motor. In the case of the system box, the live parts closest to the ground will usually be the heater connections. …M7® systems offer a longer life expectancy than traditional, non-M7 technology? Balboa’s systems feature automated diagnostics, electronic non-pressure switches, and dip switches, some of which can be configured in the field for greater flexibility. 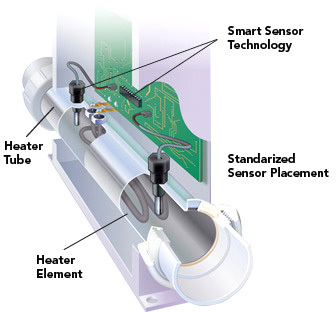 ...M7® sensors monitor each other via software to accurately measure water flow and temperature? These smart sensors offer multiple high-limit safety systems, eliminate excessive cycling and automatically adapt to flow direction. …Most of the components in a spa create electrical noise that can interfere with a variety of spa equipment? To suppress this noise, Balboa’s line of controls features built-in hardware and software filters that optimize hot tub electrical operations. …Having output connectors onboard eliminates the maze of wires in the enclosure and ultimately reduces assembly time, corrosion and the margin for error? Connectors that are mounted on the board are less susceptible to corrosion and are less likely to come loose since they are inside the enclosure. This also means that there are fewer holes in the enclosure so the entire system is protected against moisture and chemical intrusion. …High amperage components such as heaters, pumps and blowers can cause undo wear and tear on relays if they are not turned on correctly? Balboa’s EL/GL line of controls uses “zero crossing technology,” so those components are turned on and off at the optimal zero crossing of AC power. This means relays can be expected to last virtually a lifetime. …Moisture can cause premature failure of a membrane switch no matter how small? Balboa’s patented Piezo switch technology makes our panels more reliable due to its design with no moving parts, no contacts, no air gaps and no electrical current to cause problems. …Piezo switches are user friendly? Not only is the Piezo moisture proof, but the panel can be installed facing the inside of the tub for ease-of-use by the tub owner. The Piezo is also four times larger than the average membrane switch, which makes it the perfect size for a fingertip. …The selling price of a spa pack system is only a fraction of its comprehensive lifetime cost? Equipment failure and servicing costs can be staggering over the life of a product. That’s why Balboa builds the highest reliability products available and even provides remote diagnostic tools to help OEM manufacturers and service technicians cut costs in the installation and repair processes.